← Will R. Bird’s ‘Call Off The War!’ (1929)…. 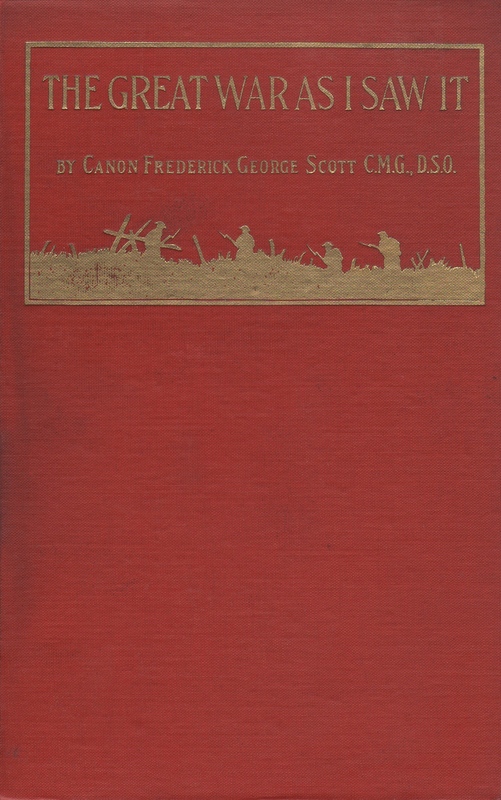 Canon Scott’s “The Great War As I Saw It” (1922)…..
A fairly recent addition to the ever-growing library here at Field Punishment No. 1: a very good copy of the first edition of Canon Frederick George Scott’s The Great War As I Saw It (1922). There is some soiling, a touch of foxing, and there is a tear in the front hinge. Alas, the book is also missing the dustjacket. It was at Robecq, that I had my first sight of General Haig. I was standing in the Square one afternoon when I saw the men on the opposite side spring suddenly to attention. I felt that something was going to happen. To my astonishment, I saw a man ride up carrying a flag on a lance. He was followed by several other mounted men. It was so like a pageant that I said to myself, “Hello, here comes Joan of Arc.” Then a general appeared with his brilliant staff. The General advanced and we all saluted, but he, spying my chaplain’s collar, rode over to me and shook hands and asked if I had come over with the Canadians. I told him I had. Then he said, “I am so glad you have all come into my Army.” I did not know who he was or what army we were in, or in fact what the phrase meant, but I thought it was wise to say nice things to a general, so I told him we were all very glad too. He seemed gratified and rode off in all the pomp and circumstance of war. I heard afterwards that he was General Haig, who at that time commanded the First Army. He had from the start, the respect of all in the British Expeditionary Force. Unfortunately, there is no marginalia. 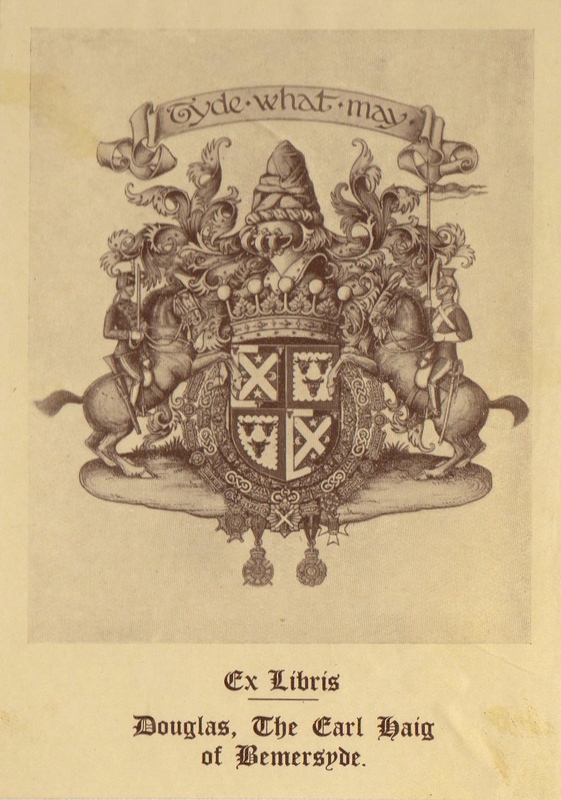 This entry was posted in Uncategorized and tagged Canon Scott, Douglas Haig, Ex Libris, The Great War As I Saw It. Bookmark the permalink.